Pricing is customized based the RFP type, frequency and size. 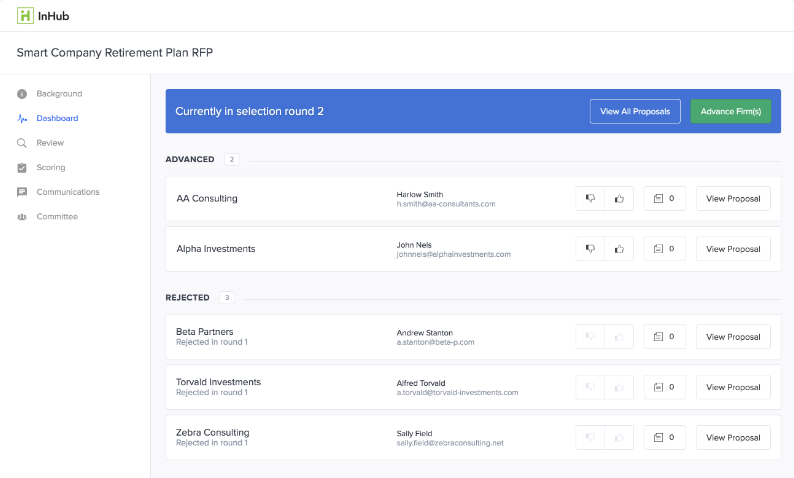 RFP Tool for Investment Fiduciaries: InHub's RFP solution allows users to create a customized RFP questionnaire, submit the questionnaire to chosen candidates, evaluate proposals side-by-side, take notes online and prudently document the entire process for a fiduciary audit file. Common RFPs types include Investment Consultant RFPs, Recordkeeper RFPs, Actuarial RFPs, Trustee RFPs, Investment Manager RFPs and more. Sample RFP questions, potential candidates and additional services are offered. In Hub was an efficient and effective means to compile responses to the many questions in our RFP. Pros: In Hub saves time for all involved in the RFP process. The software interface is pretty intuitive and addresses the key steps in the process in an organized and professional way. I appreciate the fact that all communications are documented in the platform and the ability to score the proposals using our criteria was helpful in structuring our discussion about the bidders. I received compliments from bidders who thought the RFP process was well-run and I think the platform helped to reinforce our process as comprehensive and thoughtful. In Hub staff were readily available to me when I had questions about the platform or needed advice on best practices on the RFP process. The process of getting the site up and running was simple and happened very quickly which helped us to adhere to our timeline. The reporting capabilities were robust and included the ability to filter the data in various ways with a few clicks. Overall, I found the tool to be well designed, easy to use , and efficient. Cons: There is very little I did not like about the software. For users who need guidance on how to use the software, In Hub is working on some brief tutorials but, support is also readily available for users who call or email In Hub. Overall: The software was an efficient and effective platform to host, compile responses, and communicate with bidders. The process is documented in one central location and the RFP information was available to all users throughout the process. In Hub produced a due diligence report that is helpful for our documentation purposes. The software saved me alot of time I might have spent cutting, pasting, information from the bidders to facilitate decision making. Comments: The process was fantastic. If we had handled this ourselves (offline and without the virtual guidance) it would have taken MONTHS if not a year longer! We would absolutely recommend InHub to other investment committees that plan to do an Advisor RFP. InHub has a class act of teammates and was worth every penny! Pros: A centralized location for maintaining RFP responses. Also allows the comparison of multiple responses at one time. Cons: Navigation can be tricky at first. Overall: A great tool to help with a project that requires coordination and organization. I highly recommend.